My husband and I have lived in Countesthorpe for over 40 years. I have researched my family history. for some years and have published most of my findings on this web site. Since I left work, I have enjoyed studied computing and Web Site Design both at South Leicestershire College (HNC 2006) and with the Open University. I have recently completed a BSc Honours with the Open University. Most of my modules were in Earth Science and I am studying an MSc with them now. I attended two Geology residential courses at Durham University. Click the link to "Summer School" to see some of my photos. If you want to study while meeting a great bunch of people and getting lots of exercise, this is the residential course for you. The people are so friendly and we love the gardens and scenery but most of all, the mild winters. 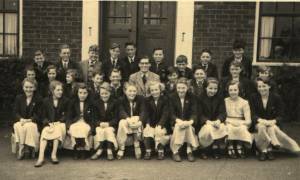 I went to Houghton Grammar school in the 1950s here is the only photo I have of my time there. And from May 31 this year, graduating with my BSc Honours at Ely. A larger image is also available. I am on the front row 3rd from right.